Pest description and crop damage Adult plant bugs are flattened, semi-oval insects 0.19 to 0.25 inch long. They can be yellow, green, and dark brown to black with a conspicuous yellow or pale green triangle on the back. 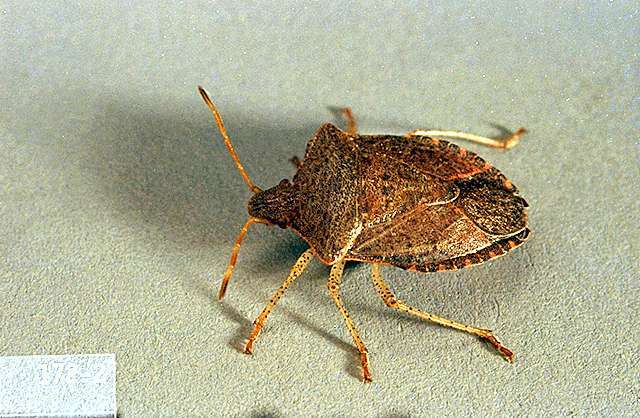 Adult stink bugs have a flattened shield shape. Length ranges from 0.25 to 0.5 inch and color from gray to brown to green. Stink bugs are noisy fliers, with long, piercing-sucking mouth parts. Bug feeding damage causes dimpling and sunken spots on young fruit that can deform the shape of the fruit by harvest (often referred to as cat-facing). Internal fruit damage appears as white corky areas under the surface of the fruit. Feeding may deform or kill buds and shoots. These bugs have an extremely wide host range that includes field and vegetable crops, hay crops, natural vegetation in uncultivated land and weeds in adjacent areas. These pests do not reproduce on tree crops, but invade from outside hosts. Biology and life history Adults overwinter in groundcover. Early in the season, they feed on weeds in groundcover and adjacent fields. Later in the summer as alternative hosts dry up, these bugs may move into the canopy of fruit trees. Pest monitoring Periodically scout the canopy of fruit trees for the presence of adult plant and stink bugs, particularly in trees with a history of bug damage to the fruit. Critical times to scout are when the adjacent weed hosts are drying up or nearby host crops are being harvested. When possible, do not plant apricot trees adjacent to hay fields, weedy lots or uncultivated land. Proper weed management early in the season can reduce the attractiveness of an orchard to these pests. DO NOT mow orchard floor within two weeks of fruit harvest as any bug infestation in the ground cover will move to the tree canopy. Spray applications, primarily pyrethroid products, target the adult bugs. These products work best as spray residues that intercept plant and stink bugs as they move between alternative host sources and fruit trees. kaolin-When sprayed on leaves, trunks, and fruit, kaolin acts as a repellant to some insects. Some formulations are OMRI-listed for organic use. esfenvalerate (Asana XL) at 2 to 5.8 fl oz/100 gal water (4.8 to 14.5 fl oz/a). PHI 14 days. REI 12 hr. May disrupt beneficial mite populations. Extremely toxic to fish and aquatic invertebrates; avoid spray drift and runoff to surface waters. lambda-cyhalothrin (Warrior II1CS) at 1.3 to 2.5 fl oz/a. PHI 14 days. REI 24 hr. May disrupt beneficial mite populations. Extremely toxic to fish; avoid spray drift and surface runoff.